Whether it’s due to delays or missed connections or BOTH, flying is stressful enough these days without having to worry about one’s dietary needs. Health gurus and raw foodies alike however know the difficulties of finding fresh, healthy fare in airport terminals. Save for a few major airports (i.e. JFK, ORD, & SFO), natural and vegan food sightings are rare. Thus in one of my recent jaunts across the country, I was pleased to discover a solution provided by a company called GoPicnic*. The innovative brand offers an assortment of all-natural, ready-to-eat boxed meals, now found in many airports nationwide. 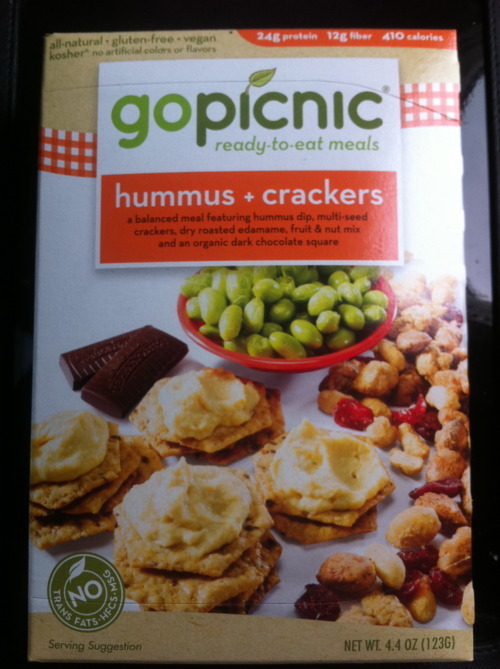 Available in 4 varieties, the vegan option is the ‘hummus & crackers’ one. The combo includes Wild Garden hummus dip, multi-seed crackers, a dry-roasted edamame packet, a ‘baja blend’ of fruit & nuts, and last but not least an organic, dark-chocolate square by Terra Nostra. Although it seemed too good to be true at first, the package contents and ingredients are clearly labeled, so there can be no denying its preservative-free goodness. While not the tastiest hummus I’ve ever had, its easily portable design and quality ingredients more than make up for it. Another perk is that the meal cost only $4.99, which is a steal compared to most ludicrously-priced airport products (FACT: I once unwittingly paid the same amount for a 16oz bottle of San Pellegrino). Obviously packaged meals cannot replace the nutritional value of fresh food, but this is a viable alternative to the usual highly-processed airport offerings. One last recommendation is to pack a baggie of fresh veggies to go (such as celery or baby carrots) to pair with the hummus…to ensure you’re getting at least some raw nutrients! However, lest you forget to plan ahead—gopicnic is a practical means for refueling the next time you find yourself trapped in an airport with no provisions. *Just thought I should mention that these reviews/opinions are my own…no endorsements here!